(L-R) teacher Steven Fung with students Safa Elzanfali, Joe Arrigo, Francis LiButti, and Arhum Choudhry. 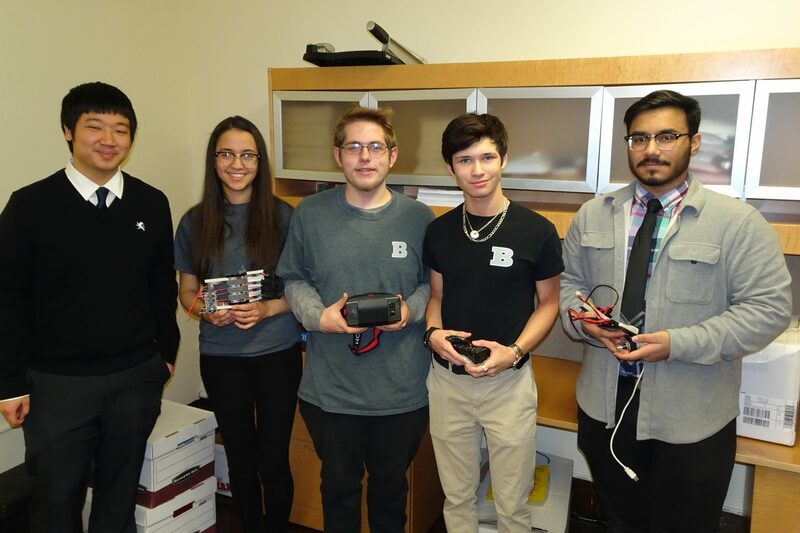 The future of firefighting could be robotic, predicts a group of Bayonne High School students who won a robotics contest for a firefighting robot concept. Their idea won a small group of computer science students a spot representing New Jersey in the “Solve for Tomorrow” contest in the spring, sponsored by Samsung, Korean electronics manufacturer. A robot that can replace a human in hazardous situations, like firefighting, has real-world applications that serve local communities. That was one of the requirements of the contest. The students are now preparing to present a prototype at the pitch event in the spring. They need to code and build a robot complete with two arms, tank treads, and an infrared camera on an articulating head, while withstanding temperatures of up 1,500 degrees. They’re considering including an aerial drone to survey the fire site. They hope the total cost will stay below $3,000. The group’s previous projects include an autonomous snow and ice plow, like a Roomba for sidewalks, and a submersible robot they launched in the Newark Bay. The robotic firefighter is a bit more ambitious. Building the robot, they say, is the easy part. They put together a robot on a bus ride to a robotics event, and they have an in-house 3-D printer to create custom parts. The hard part will be coding the Raspberry Pi CPUs that control the robot to respond to human commands and fireproofing the electronics so they stay functional in high heat. The students, all of whom want to study some form of robotics or STEM in college, are optimistic about how technology will be used in the future. “Technology is a promising force in our world,” said Safa Elzanfali. “We talk about that all the time,” added Choudhry. All the students agreed that building a robot to metaphorically risk his or her life in place of a human firefighter is a laudable concept. Arrigo and LiButti personally know firefighters injured in the line of duty; any technology that can take them out of that line, they see as beneficial. The five-member robotics team studies under math teacher, Steven Fung, and math director, Dawn Aiello. As a prize for winning the first round of the contest, the department will receive $20,000 in Samsung electronics. The group will also receive a kit to record a three-minute video as part of the final round of the contest. Three national winners will be selected in the spring; each school will be awarded a $100,000 technology package.